New Orleans’ architectural history is on display at many turns. Virtually all the city’s late 19th century built-up area is included in one historic district or another, and it is distinguished by having one of the largest percentages of intact pre-World War II buildings of any American city. Historically, expansion was dictated by its low elevation. The highest ground – about 10 feet above sea level – fronts the Mississippi River dropping below sea level away from the river, save for a few low ridges. Before the installation of modern drainage pumps after 1900, the city remained concentrated within a mile or two of the river. Founded in 1718 by the French on the site of today’s French Quarter – or Vieux Carré (Old Square) – La Nouvelle Orléans protected the southern end of Louisiana from other European powers, and was near Lake Pontchartrain and Bayou St. John which provided a shorter, safer route to the Gulf of Mexico than does the Mississippi. The former Ursuline Convent is the only French colonial building still standing in the Quarter. Completed in 1752-1753, the building has been used as a convent, bishopric, school, meeting place for the Louisiana legislature, archives, and now a museum. Louisiana fell under Spanish rule in 1762, and when fires leveled New Orleans in 1788 and 1794, new buildings were Spanish in style marked by horizontal lines, arches, plastered brick and timber walls, slate or tile roofs, courtyards and hand-wrought iron, all of which gave the city a distinctive Spanish appearance. The great bulk of French Quarter buildings were built after the United States bought Louisiana in 1803, and the mass-produced cast iron that provides the lacy look did not appear until the 1830s. By 1900 the area had become ramshackle – considered by many to be a slum – and threatened with demolition, but a strong preservation movement helped save it from destruction. In 1788 Faubourg (suburb) St. Mary – now the Central Business District – was established, followed by Faubourg Marigny downriver from the French Quarter in 1806, and Faubourg Tremé to the Quarter’s north in 1810. Both were plantations named for their owners who subdivided them, and French Creoles gravitated here which initially filled more quickly than St. Mary. Marigny extends downriver to Press Street – commemorating a long-gone cotton press on the riverfront. While it has some houses dating to the 1810s, Marigny’s Frenchman Street today resonates with thriving restaurants and music clubs. Nearby Tremé early on had a sizable population of free-people-of-color, and is regarded as the United States’ earliest distinctly African American neighborhood. By the mid-19th century Tremé and Marigny were also heavily populated with European immigrants. Downriver from Marigny is Bywater – named for a telephone exchange – which built up between the 1830s and 1900. It is primarily residential with many Victorian shotgun houses – long, narrow structures where a bullet fired through the front door exits through the back – found throughout late-19th century New Orleans working class neighborhoods. North of St. Claude Avenue – about five blocks from the river – is a flood-prone area that experienced scant building before 20th century drainage. 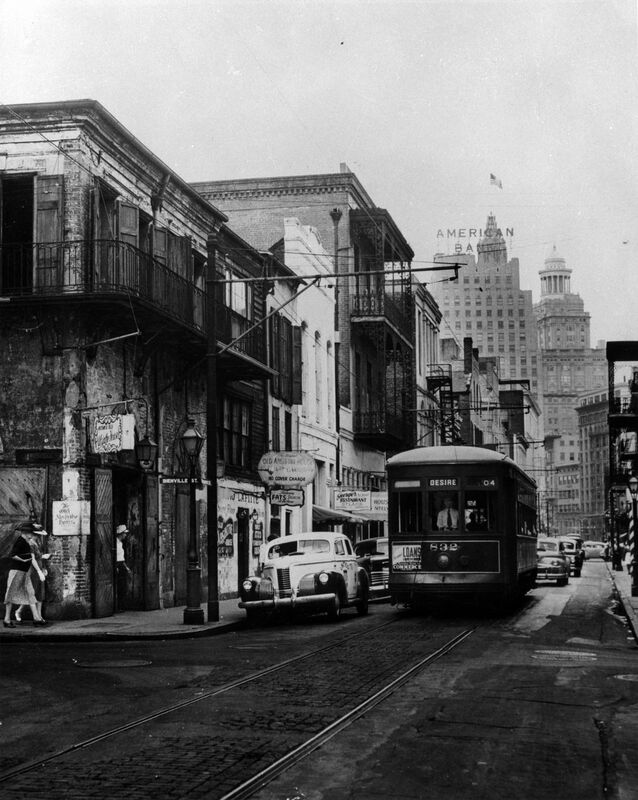 Beginning in 1920 the Desire Streetcar line – now a bus – chugged through here toward the French Quarter. Bywater is in the Upper Ninth Ward, one of the city’s seventeen wards, and is separated from the downriver Lower Ninth Ward by the Industrial Canal which opened in 1923. Lower Nine near the river began developing in the late 19th century and is now called the Holy Cross historic district named after a Catholic boy’s school which relocated to Gentilly, a 20th century neighborhood near Lake Pontchartrain, after Hurricane Katrina. Farther away from the river, Lower Nine was mostly small farms and dairies until the 1940s, when it began evolving into a predominantly African American neighborhood. The Crescent City’s main growth area throughout most of the 19th century was upriver from Canal Street within the great bend of the river. Called Uptown – as opposed to Downtown which is downriver from Canal – it is a sprawling area once composed of numerous plantations fronting the river and subdivided by owners to accommodate the city’s rapid growth in the first decades of the 19th century. (As the nation’s third largest city, its population reached 100,000 by 1840.) Uptown is less flood-prone than Downtown, with land above sea level and thus safely accommodating more housing. Uptown grew like a carpet being rolled out along the river, and is divided into smaller neighborhoods. Unlike the French Quarter, its houses are set back in large gardens. The earliest neighborhood – although not named until the early 1960s – is the Lower Garden District just upriver from the business district, and laid out between 1807 and 1810 with streets named for classical deities and muses. Uptown contains some of the loveliest residential architecture in the city, and the term Garden District once referred to all of the tree-lined Uptown streets. Today the Garden District is the area between St. Charles, Magazine, Jackson, and Louisiana, where large houses ranging from 1830s raised cottages to later Greek revival and Queen Anne mansions can be seen. Historically Uptown near the river was modest and working class and included the Irish Channel. The most affluent areas were between Magazine Street and just beyond St. Charles Avenue, but became less so farther back in the low-lying area once called “Back-O‘-Town.” Uptown is divided into smaller neighborhoods, such as Central City between the business district and St. Charles which was “Back-O’-Town” and once home to many German and Irish immigrants. The sprawling University Section, which surrounds Tulane and Loyola Universities and Audubon Park with its world-class zoo, resembles the Garden District. Uptown was once part of neighboring Jefferson Parish and composed of several formerly independent towns annexed by the city between 1853 and the early 1870s, including Lafayette where the Garden District and Irish Channel are located, Jefferson City between Lafayette and Audubon Park, and Carrollton upriver from the park. While Carrollton, with its many 19th century houses, is part of the city, it retains its old name, much like Algiers which is across the river from the French Quarter. St. Charles Avenue, with its miles of live oaks, mansions, houses of worship, schools and universities, has been the site of the St. Charles Streetcar line since 1835. Originally more of a railroad, the line made Carrollton accessible to Canal Street (which was never a canal) and helped tie Uptown neighborhoods together. Magazine Street, which parallels St. Charles a few blocks toward the river, was once said to separate working class neighborhoods near the river from wealthier ones near St. Charles. 19th century Magazine had several public markets and business areas and today retains the distinction of being Uptown’s chief shopping street, where numerous Victorian houses have been converted to upscale shops. With the introduction of the city’s modern drainage system and subsequent draining of cypress swamps, new neighborhoods north of St. Charles, like Broadmoor, began to take shape. Mid-City, named in a contest sponsored by a bank in 1920, started growing slowly past Tremé by the mid-19th century to become the city’s main growth area while reaching City Park in the 1920s. By the 1930s with the construction of a seawall designed to keep out winddriven water from Lake Pontchartrain, growth of Lakeview and Gentilly, begun at the start of the century, greatly accelerated their growth across former swamps, especially after World War II. Eventually 20th century bungalows and ranch houses filled these areas, ushering in mid-20th century suburban sprawl. Within the city limits Eastern New Orleans spread across former swamps, while adjacent to the city in east Jefferson Parish and on the Westbank of the river, new highways and bridges prompted building of new subdivisions farther afield.